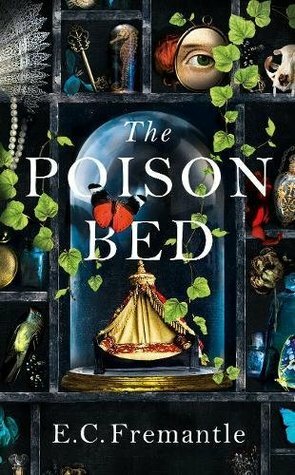 Elizabeth Fremantle's THE POISON BED is a chilling, noirish thriller ripped straight from the headlines. I listened to the audio version of this and have to give thanks to the wonderful narrators - Ross Anderson and Perdita Weeks - for bringing this dramatic story to life and giving an extra depth to the story with the way they portray 'him' and 'her'. The him and her are Robert Carr and Frances Howard, both pivotal characters at the heart of the court of James I and this story brilliantly captures a troubling and scandalous time in British history. They are accused of poisoning Lord Thomas Overbury and the story plays out as to the motives, means and subterfuge behind the plot and makes for fascinating listening, especially as I knew very little about this period of history and it has peaked my interest to investigate more! Frances and Robert are both extremely fascinating characters - Robert is very close to the King, but is betrayed by his own lustful thoughts towards Frances which becomes obsessive with his pursuit of her. Frances is no stranger to getting what she wants from life and a disastrous marriage to Lord Essex gets her notoriety but not happiness. Behind the scenes there are many plots to gain power over the King, and the manipulative behaviour displayed is quite staggering at times - there is no 'playing fair' in these high stake games that are being played and it's all about getting what you want, no matter who you damage in the long run and I loved how devious some of the characters were in their quest for power. The way the story is told from both perspectives also really worked well - you get to see their lives before, during and after the court case and allows you to get to know both characters even better. This is a gripping piece of historical fiction and gives a real insight into just how underhanded life could really be in the Jacobean court!